During the prayer and at the mention of my wife Monica, who is deceased, being departed. My five year old granddaughter, also named Monica, blurted out “where did I go”. Well as you can understand that changed the solemn tone of the prayer to one of laughter. After Marianne’s prayer I got up to introduce the reason for the event and how it came about. This comprised of the first page of this blog. Once I was finished, Marianne introduced as much of her family as she could remember, I did the same, Gail stood up for my missing brother Sam and introduced their family, and then Jess did the same for her family. After the laughter died down the food started to arrive and we began to eat and continue talking. During lunch my mind drifted to thoughts of my mother and father, Rose and Frank, and how I hoped they were looking down from their home in heaven to see the beautiful family and rich legacy they left behind. I found that at that time I missed both my parents just as much as possible. I could see the beautiful smiles on both of their faces, and the gleam in their eyes. I am sure this reunion had made them a little happier in their home in heaven. Of course I thought of my wife Monica and how happy she would be to see the additions to our family, little Monica and her great granddaughter, Alexis. My thoughts ended thinking about my nephew Jerome, the first of this clan to depart the earth and head to heaven. He was a young man who did not need to be taken so early in his life. I am sure that he is missed by his father and mother as well as all of his family. We talked of old times and I did a lot of remembering. It was such a shock to see people who I remember more as a child stand in front of me as young adults. The children I remember as children had children of their own and OMG yes some of these children had children. Heck not only was I a great grandfather I was a great uncle as well. What happened? Had I fallen asleep only too awake as a much older person? Oh what the hell. I am happy and joyful to not only be a member of this group of wonderful people but I know that I am a little part of each person present. The reunion was beneficial to me because I was able to see my nephews and nieces who I could only remember as children present with their families and being social with cousins they had not seen in years. I was very happy for one of my granddaughters who much earlier this year had asked me why we did not have family reunions like other families. I know that this is just the Giudicessi half of the family and as a starting point that was a lot of work. Who knows maybe next time we could include the Federico half next time. I am sure there is someplace in California large enough to have such an event. Now, I must thank my little sister, Jessica, for all the effort and time spent to put this little reunion on for the Giudicessi families. I will also relate a story that was told to me shortly after the reunion was over. Well it seems that some families continued the gathering of the Giudicessi families once the lunch was over. One group consisted of my two daughters families. Yes, Deborah and Susan decided to head to Deborah’s home and relax in the pool with the children. The story as told to me by my daughter Deborah went something like this. The four youngest girls, Abby, Braylin, Monica, and my great granddaughter Alexis were playing and talking in the pool when Alexis shouted out that she was a “Giudicessi Girl”. With that she got out of the pool and told her grandmother, great aunt Susan and soon to be great uncle Bruce that she was a “Giudicessi Girl”. Deborah made me smile with the telling of this story as it only drove home the fact that this reunion was special and very important to one and all. I saw a large group of people talking and laughing. To my surprise that large group of people was my family. I saw some family members that I had not seen for a long time. It looked to me like the event was off to a good start. After a quick huddle with my two sisters, Marianne and Jessica, we shared the information about our brother Sam and his wife Anne. They would not be able to make it to the party as Sam was ill and Anne did not want to leave him home alone. This was very sad news as we all wanted our brother and his wife to be present to enjoy the family. With the three of us together we started talking and saying hello to other family members. My daughter Susan called me to explain that she and her sister had taken a wrong turn but would arrive just a little late. I was glad because they comprised of all of my grandchildren and my great grandchild. It just would not be a reunion without them. Soon after the call Susan and her family arrived. Deborah with her family was right behind Susan and with her was my great granddaughter, Alexis. I noticed that my oldest grandson, Jordan, Alexi’s father, was missing from the groups and it was then I remembered that he had called explaining how he had to work. Again I was very sorry that he like my brother and sister was unable to make the family reunion. I noticed that all three of Marianne’s boys, Frank, Gary and Brian, were present along with their families. Jessica and David had all of their children, Josh, Dave, and Jenny, present and with their families. I saw Gail and during our talking saw Rosie and her son Evan. The last family member to arrive was Taryn. Taryn is a lovely young girl and I was very happy she was able to make the event. In the fall of 1946 Frank and Rose were blessed with a beautiful baby boy. They were speechless with the beauty of this child and as we all know there is something special about the first Italian son born to Italian parents. They choose to name this special young man John Alan, after his grandfather, and thanked God every day for blessing them with such a wonderful boy child. Shortly after the arrival of this child Frank and Rose were provided another boy child. This child was named Samuel, he was named after Rose’s father, but please remember he was the second boy child, not the first, so he could not be as important as first born boy John. We really do not know how (and I am sure that Frank and Rose did not know either) but some time later a fourth child was born to Frank and Rose. This child was a beautiful baby girl named Jessica after Rose’s mother. So as you can see that Frank and Rose Giudicessi Family had begun. Marianne and her first husband Gary Stephen had three boys Frank, Gary and Brian. Marianne and Gary divorced and after a reasonable time both remarried. Marianne married Bill Corcoran, and they have been very happy for 18 years. John Alan’s and his wife Monica (now deceased) were married for thirty-eight years and had two daughters Deborah and Susan. John’s family now consists of his two daughters, his partner Marti and her two children Alexandra and Chris. Sam’s and his first wife Gail had two children Rose and his deceased son Jerome. His divorced wife Gail will always remain a Giudicessi family member. Sam and his wife Debbie have been together for many years now. Jessica’s family consists of husband David and their three children, two sons Josh and David, and one daughter Jennifer. The four children of Frank and Rose Giudicessi and their families would become the initial group to participate in the reunion. Dessert: Tuxedo Mousse Cake, the Lemon Cake was lost so all who ordered it were out of luck. This event was planned months in advance with the hope that as many as possible would attend and have a good time. The planning stage identified just what individuals would be invited to this first ever event. This decision was very important because it determined the approximant number of possible attendees. Frank James Giudicessi married his sweetheart Rose Marie Federico on May 17, 1942 in Des Moines, Iowa. Young Frank James Giudicessi was waiting to be drafted into the military when he chooses to steal Rose Marie Federico’s heart. Rose Marie Federico also 19 was engaged to marry Vince Indaverri. Frank and Rose both grew up in Des Moines, Iowa, on the same street and just a few houses apart. In my talks with my father, Frank, there was only one woman in the whole world for him and that was Rose Marie. Well I do not know all of the details but Rose broke her engagement to Vince and after a short engagement with Frank they did marry and the start of the Frank and Rose Giudicessi family had started. With their marriage blessed they were ready to start their family. To give you just a little history, Frank James Giudicessi was the first son born to John Batista and Mary Giudicessi. Frank had an older sister, Grace and a younger brother, Jim. Rose Marie Federico was born to Samuel and Jessiimina Federico. Rose had one sister, Connie and five brothers Sam, Charles, Dominic, James, and Leonard. Here it is important to point out that in addition to Frank and Rose getting married, Rose’s brother James married Frank’s sister Grace. They too had four children, two boys and two girls. Soon after their marriage they moved to San Francisco, California. Prior to being drafted, Frank and Rose were blessed with their first child Marianne. Soon after the birth of Marianne, Frank was drafted and entered the Navy to do his part in support of World War II. Rose stayed behind in California waiting for Frank’s letters and his return. It seemed like it took forever but the war finally ended and Frank returned home to his sweetheart and wife Rose Marie Giudicessi. They were now ready to restart their marriage and family. Oh yes they brought Marianne along too. Sam Giudicessi's Family with John as Sam's stand in. 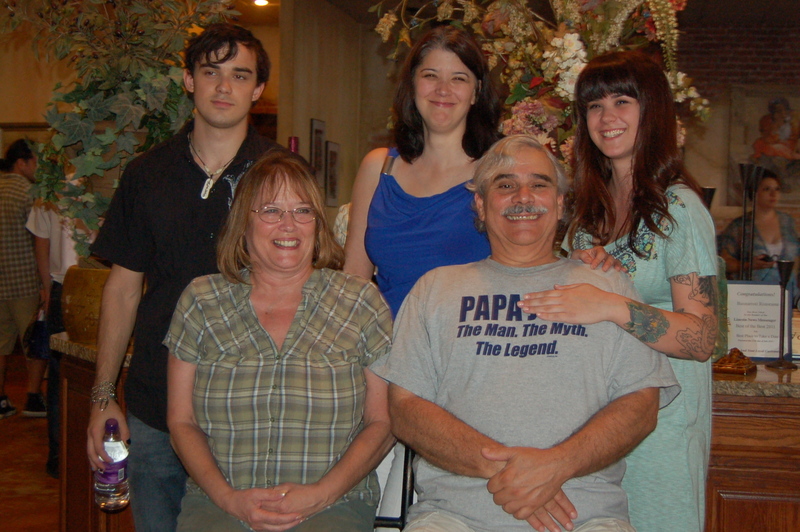 Sam Giudicessi’s Family with John as Sam’s stand in.